In the age of central air conditioning, the humble ceiling fan is usually considered a minor player and sometimes just a decorative element in the home. It might be up and out of the way, but the rotation of your fan can have a real impact on your indoor space if you know how to use it. Understanding the effects of ceiling fan rotation can help you keep your home comfortable and save money on your energy bills. Your home is a mini-environment. You use your HVAC, heaters, and fans to stay comfortable by modifying the indoor air. In winter, you heat the air and maybe introduce a little humidity; in summer you cool it down. These processes use natural laws, like the ability of contained gases in your air conditioner to absorb heat, to keep your mini-environment temperate. These natural laws can also work with your ceiling fan to help you stay warm or cool and save money. Warm air goes up. This is a basic law that accounts for lots of the weather patterns we experience outdoors. Indoors the same rule applies. During the winter, all that air you're paying to heat wants to go up, up, up. It leaves the habitation zone in your rooms and strays up to the ceiling and beyond, taking up residence in your attic if your home isn't very well insulated. It can also keep traveling upward until it exits your home completely. Ceiling fans can help keep heat where it will do the most good, in the lower half of the room. They do this by rotating with the blades angled to push the air downward. It seems too simple, but natural laws don't change, and that warm air hovering around your ceiling will move downward with a little help from downward circulating air currents.The reverse is also true. If warm air rises, when it's hot, moving air upward encourages the warm air away from the habitation zones in your room and helps you take better advantage of the cooler air coming from the air conditioner or an open window. This approach has multiple benefits. It helps keep you cooler when you don't have an HVAC system and saves you money when you do. Think of it as an efficient air management method that's easy to understand and use. It can also be a greener approach because it doesn't require refrigerant in order to work effectively. No single setting on a ceiling fan will work for both lifting and lowering air, so some human intervention is necessary. This feat is accomplished by changing the angle of the blades. Again, this is an amazingly simple concept, but many fan owners ignore the potential for increased comfort and energy savings. You don't have to remove and reinstall the fan blades, but you probably will have to climb on a ladder or sturdy chair and take a closer look at your fan. On the housing there will typically be a small switch that will reverse the direction of the fan, an efficient way to take care of the problem. 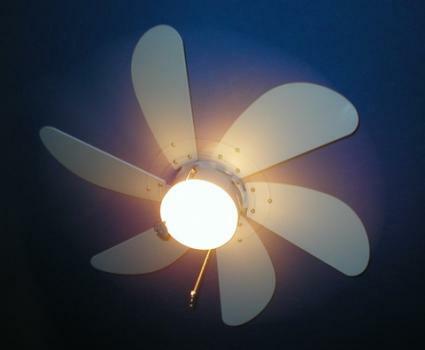 If you're not sure which way your fan is set, turn it to high and stand under it. If the air is being pushed down toward you, you'll feel it. During the winter, that's the appropriate setting. In summer, flip the switch the other way. Some online instructions, including those of the Department of Energy, will recommend that you just check the fan's spin: clockwise for the summer season and counterclockwise in winter. Newer ceiling fans don't necessarily comply with this standard configuration, so standing underneath the fan is the only foolproof way to be sure you've got it right. If you're still stumped, even after this test, try standing under the fan with a candle. The flame will elongate if the air is moving upward and stutter or go out if it's moving downward. The rotational direction of your ceiling fan can help you use your heating and cooling systems more efficiently and keep you comfortable. Take a closer look at your model and familiarize yourself with how to change the blade directions so you can easily switch them as needed.